Wow, I can’t believe it’s been so long since I posted last! Things have been nuts with work, and some travel as well. While I haven’t cooked much, I actually have a backlog of recipes that I just haven’t been able to find the time to put together and post. July has been a whirlwind. My mom came for a visit, which was great. We cooked an awesome dinner one night, but I also talked her into getting burgers, Thai, and Chinese takeout. Which was bomb. Then last week I was up in New York for work, then spent a long weekend in L.A. with a bestie hiking the Hollywood Hills and drinking copious quantities of wine. On top of insane work hours, what few minutes of free time I can squeeze out are taken up by the last stages of planning for our Scotland trip right now (!!). 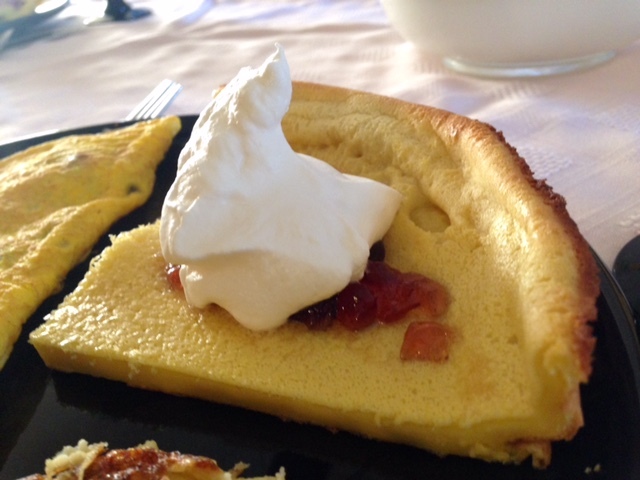 But I realized last night that I’d never posted this dutch baby recipe, which is practically criminal. These things are awesome. These aren’t something I grew up with, but it was the recipe for apple pie german pancakes that gave me the idea. I had some leftover batter, and so I looked up what to do with it. I effectively made one of these, and have been hooked ever since. They’re easy, fast, incredibly versatile, and delish! Preheat the oven to 450 F and place a 10″ cast-iron or other oven-safe skillet on the middle rack of the oven. 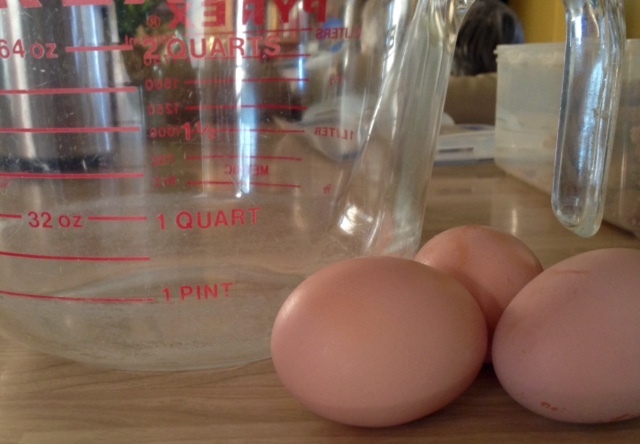 In a large bowl, whisk the eggs together vigorously until they’re light and frothy, about 2 minutes. I just use an immersion blender, it’s so easy. Then add the milk, sugar, salt and vanilla, and blend them in as well. 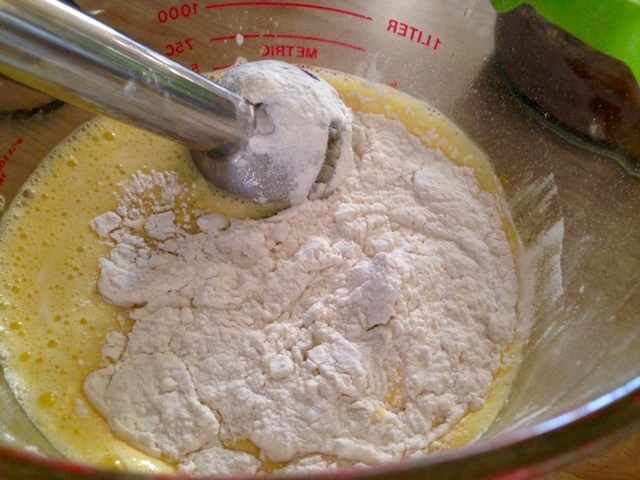 Sift in the flour and whisk until just smooth. Let the batter rest for 5 – 10 minutes. 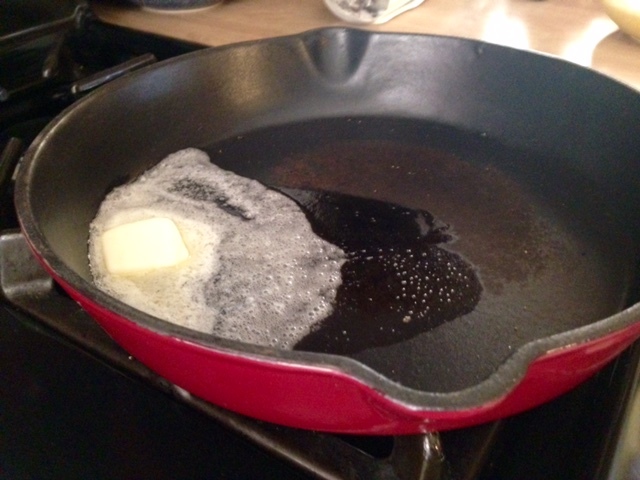 Carefully remove the hot skillet from the oven and add the butter. 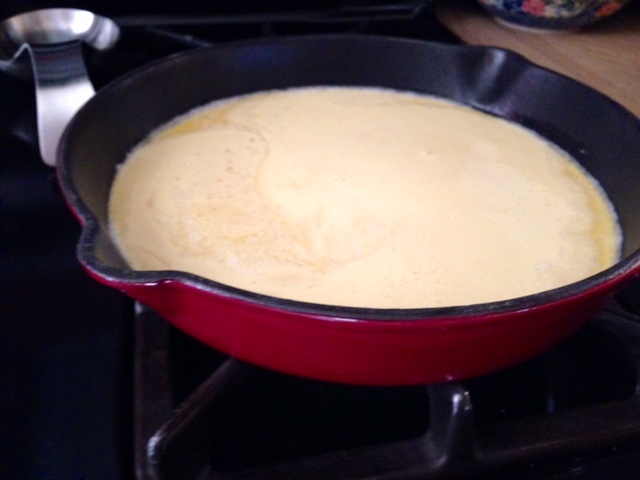 Let it melt completely, swirling the pan to allow the butter to coat the entire bottom. Immediately pour the batter into the hot pan, and place it back in the oven, shutting the door quickly so the oven loses as little heat as possible. 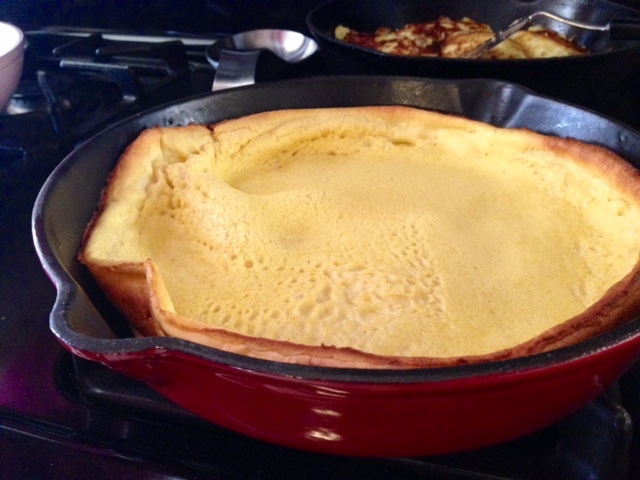 Bake for 15 minutes, until the sides have puffed up a lot, and the entire top of the pancake is golden brown. Remove from the oven and use a spatula to gently loosen the edges of the pancake. Transfer to a serving platter and cut into large wedges. You can garnish however you want. I like to sprinkle with a cinnamon-sugar streusel and some maple syrup, but fruit and whipped cream, jam, and whatever else is awesome. Serve immediately! Preheat the oven to 450 F and place a 10″ cast-iron (or other oven-safe) skillet on the middle rack of the oven. 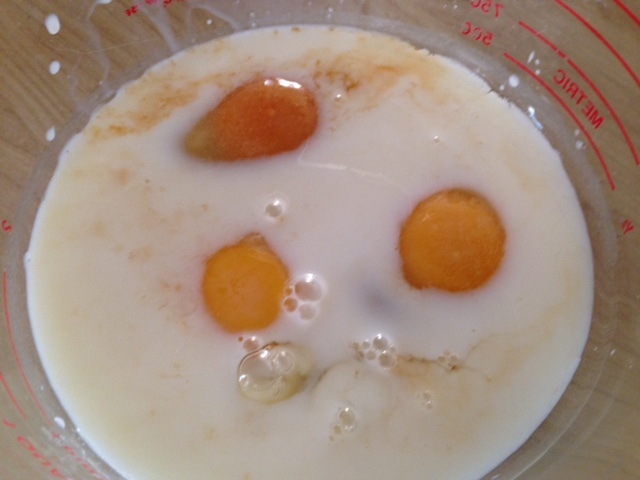 In a large bowl, whisk the eggs together vigorously until they’re light and frothy, about 2 minutes. 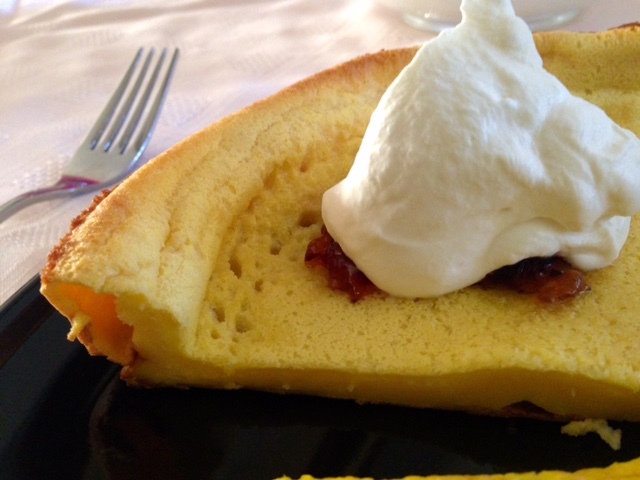 You can also use an immersion blender to get real lightness quickly and easily. Add the milk, sugar, salt and vanilla, and whisk or blend until combined. Sift in the flour and whisk until just smooth. Let the batter rest for 5 – 10 minutes. Carefully remove the hot skillet from the oven, add the butter and let it melt completely, swirling the pan to allow the butter to coat the entire bottom. Immediately pour the batter into the hot pan, and place back in the oven, shutting the door quickly so the oven loses as little heat as possible. 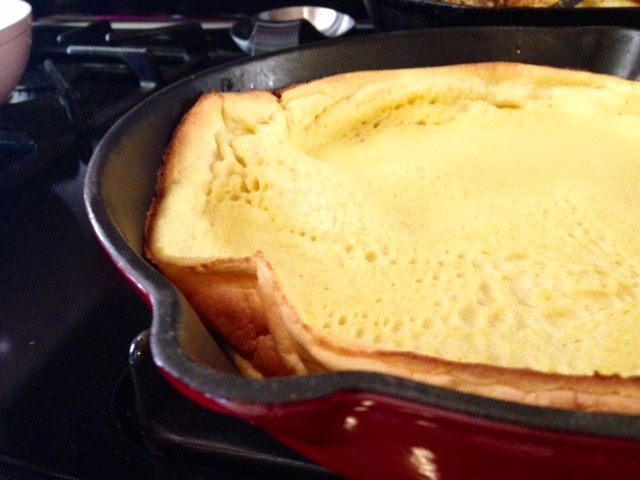 Bake for 15 minutes, until the sides have puffed up a lot, and the entire top of the pancake is golden brown. Remove from the oven and use a spatula to gently loosen the edges of the pancake. Transfer to a serving platter, dust with powdered sugar and cut into large wedges. Garnish however you want and serve immediately.